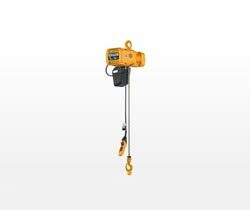 Having received acclamation from all quarters, we, a Supplier, Exporter and Importer of Electric Hoist (ER2), rank among the top names in the industry. We follow the standards of quality in every sphere of our operation for the production of flawless items at every stage. Our audit team works hard to keep the quality in synchronization with industrial quality standards. Sturdiness, durability and easy maintenance make the offer irresistible. This package of quality is on offer at reasonable rates.